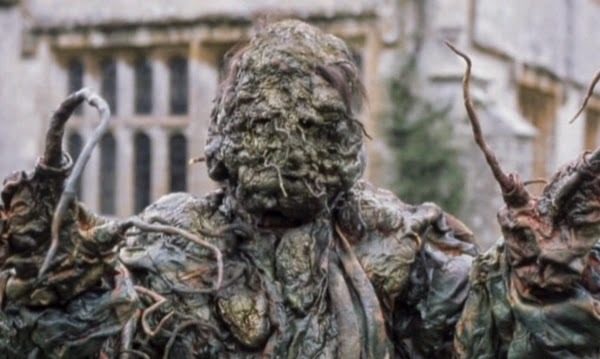 Doctor Who: Remembering THE SEEDS OF DOOM | Warped Factor - Words in the Key of Geek. When people talk about the Classic era, they habitually say two things: they say the budget constraints let it down, and they say that in spite of that, the stories were great. They could be talking about any one of a number of stories when they say these things, but arguably more than any other in the colour era of Classic Doctor Who, they could be talking about The Seeds of Doom. With its obviously-polystyrene snow in an Antarctic base, and a recycled Axon painted green and doing service as the mid-stage Krynoid, there’s a sense of budgetary corners being cut here, there and almost-everywhere (though the use of a Daimler adds an air of expense), but you only really see those things if you’re looking at them decades down the line with the weary air of modern, CGI-heavy fandom. In all its essentials, The Seeds of Doom is masterpiece Who. 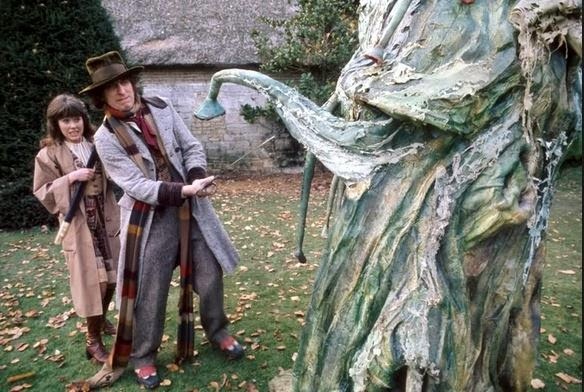 That’s partly because while Doctor Who has a chequered history of dealing with the inversion of nature – of plants rising up and killing the animalkind (can we say Vervoids and leave it at that), when it’s done right, the very idea of carnivorous plants is appallingly creepy. Don’t take my word for it, ask John Wyndham, whose Day of the Triffids has been terrifying generations through retelling after retelling. The fundamental idea of plants, with all their arsenals of techniques for colonization, fertilization and propagation, taking back their planet, is as Sarah-Jane Smith says in The Seeds of Doom, simply ‘horrifying.’ Because you can’t bargain with a plant. You can’t reason with it. If the plants rise, animalkind dies – the mathematics are on their side. The escape from Antactica by John Challis’ psycho-thug Scorby and the more academically-livered Keeler, along with a deep-frozen Krynoid pod to go, means the story can put down roots in a whole second act, with the Antarctic destruction as a mere prelude to the fugue to come. Our main Bond villain is of course Harrison Chase, a high-browed, black-gloved aristocratic Caligula, in total control of his world. We get the distinct impression that like Taren Capel to come, he was deeply unliked for the beastly little brat he was by his parents, because clearly, while brilliant in his field, he’s massively off his meds – composing atonal, not to say godawful music for his plants, and demanding, essentially, that people take him seriously with the megalomaniac foot-stamp of extreme wealth. He clearly enjoys the melodrama of having people ‘taken care of’ – and indeed of telling them they’re about to be fed into his compost compacter. It’s a better performance than you might imagine from Chase actor Tony Beckley, but it is very much to the front and centre of the acting range – there’s nuance there if you let your imagination wander over Chase’s youth, presumed lonely in a big house, seen but never heard, talking to plants for company and so going quietly, determinedly doolally – but in terms of the drivers of the story, Beckley shoves Chase right to the front, proper villain style, and paints him in primary greens and blacks. 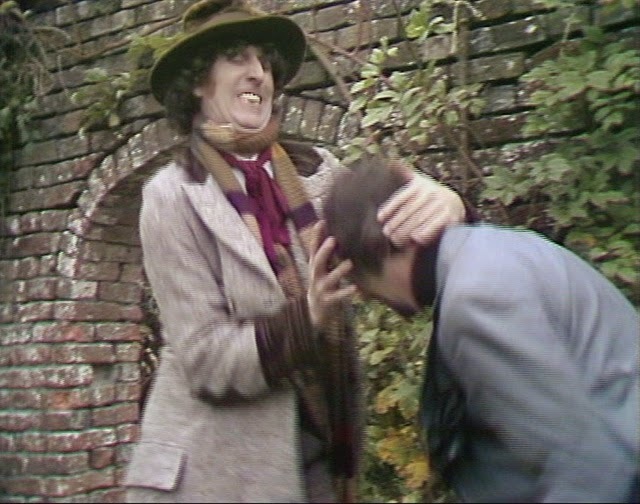 Conversely, The Seeds of Doom shows Tom Baker’s Fourth Doctor in uncharacteristically pugilistic style – Pertwee’s Third Doctor was never more at home than when practicing his Venusian Aikido, but the Fourth Doctor tended to bamboozle his way out of danger more often than not, so there’s a degree of culture-shock in seeing that same Doctor cold-cocking thugs with a fist to the face, or brandishing guns about the place to get his way. It’s a Doctor that Baker was to shy away from more and more as his time in the Tardis went on, and the Fourth Doctor is never really as at home in action hero mode as he is here. 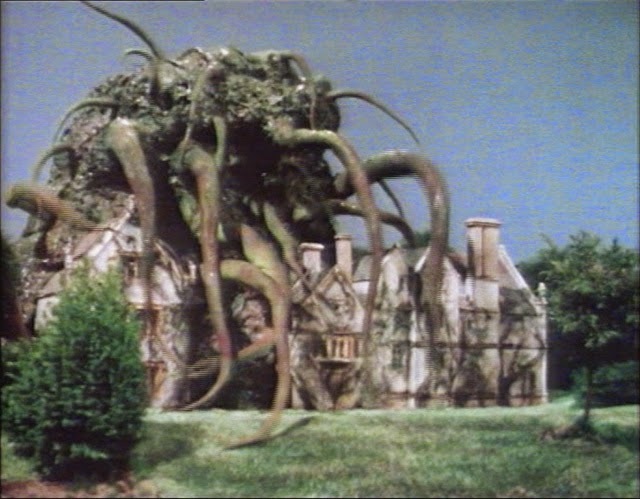 As the story unfolds and Chase and the Krynoid make a telepathic connection, the true Triffid terror at the heart of the story – something familiar turned against humanity – grows more and more imposing, the Krynoid bringing all the other plants at Chase’s mansion under its sway and making the very environment deadly to humans, a kind of Greenhouse of Horror. The body count rises as the Doctor’s initial suspicions play out like Holy Writ – those who would save and nurture the Krynoid have no idea what they’re dealing with. Dunbar, the crooked man at the World Ecology Bureau who leaked news of the pod’s existence to Chase, and inadvertently cost the lives of everyone at the Antarctic station, is killed by the Krynoid. So too is Scorby the thug, despite a half-hearted reformation of character, largely based on self-interest. Even Chase himself falling into the composter hardly makes a dent in the incredible, rapacious growth of the Krynoid – a kind of green Godzilla at this point, towering over the mansion – and ultimately, there’s no way out of the inevitable destruction of animalkind except to blow the thing to smithereens before it can release its own pods and start the ghastly life-cycle again. Continuing the Bond theme, ultimately, there’s no alternative but to bring in the RAF, and end on a big explosion. Written down, it all seems rather simple, straightforward stuff, which begs the question of why The Seeds of Doom is so regularly named in the highest echelons of Doctor Who storytelling, whenever there are polls of such things. The reasons for that are actually far more straightforward than the story itself. The basis of good creepy horror is either the extension of a primal fear into a pure threat, like the Daleks or the Cybermen, or, perhaps more often, it is the transmutation of the ordinary into the predatory. John Wyndham knew that with his Triffids. Alfred Hitchcock knew it with his Birds. Doctor Who has done it superbly well a solid handful of times – the Autons took everyday plastic items and made them kill. Fury From The Deep took seaweed, of all things, and in a story which pre-empted The Seeds of Doom to a large extent, unnerved by using it to frame the war for survival between animal and plant life. The Seeds of Doom itself takes the Triffid premise, and imagines a world where a monomaniac loves them, nurtures them, and grows them up. It shows that dichotomy between plant and animal life writ large on the screen. It’s delivered with a pace that befits a movie screen and a budget that…really rather doesn’t. But the storytelling skills it displays are still at the core of the show to this day – that trick of taking the ordinary and making it predatory is why we have the Weeping Angels. Why there was ‘something in the wi-fi’ and why stories like Listen and Flatline really blew our socks off. And the idea of a threat so large the only way to deal with it is to blow it up is still playing strongly today in stories like Nightmare in Silver. 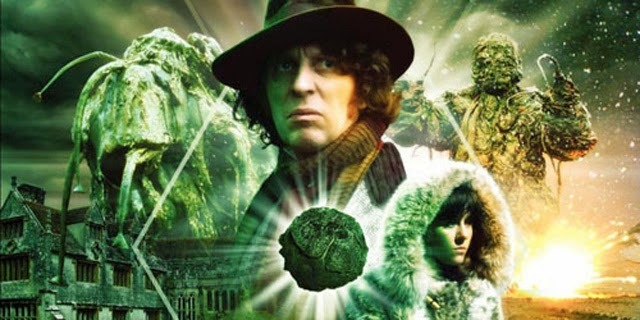 The Seeds of Doom is very much a story from the 70s, with its ecological theme very much seen as the concern of the lunatic fringe – remember The Invasion of the Dinosaurs, with similarly well-intentioned greens aiming to take the planet back to a ‘golden’ age? The note of ecological dismissal is still here. But the skill with which the story is written, directed and delivered by the actors is highly elevated – it stands alongside stories like Spearhead From Space and The Caves of Androzani, and as such, if you find yourself with three hours to spare, it refuses to disappoint on any level – except perhaps the polystyrene snow. If you’ve had your appetite for killer plants whetted, check out Hothouse in the Big Finish range for a modernised and updated take on the threat of the Krynoids.